Sometimes I eat things that are not butternut soup. Most times, actually. I guess it’s just butternut madness time and I’m always sick so I always want soup. Also, it’s still 85 degrees here in October! So who doesn’t want a bowl of hot liquid for dinner? 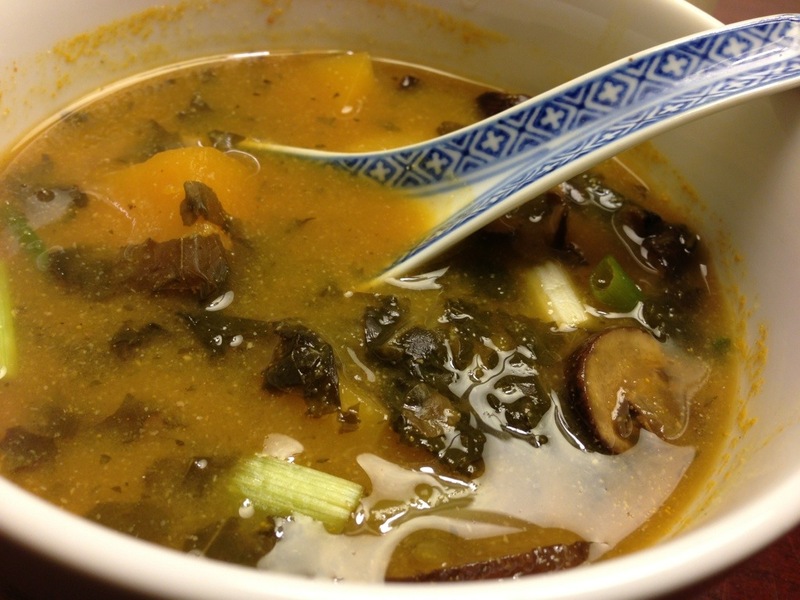 This soup is so umami. 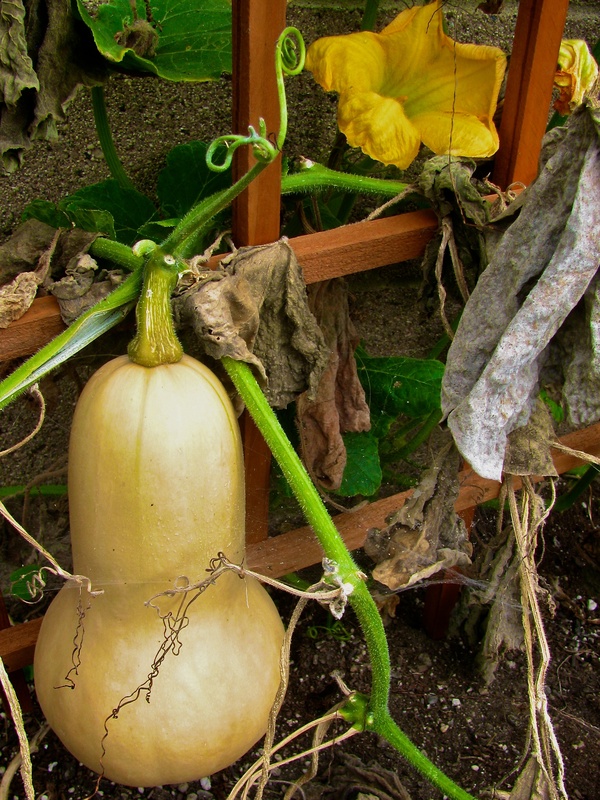 I love it’s earthy hearty flavors that are paired so nicely with the sweetness of the squash. It is missing a little something, though. 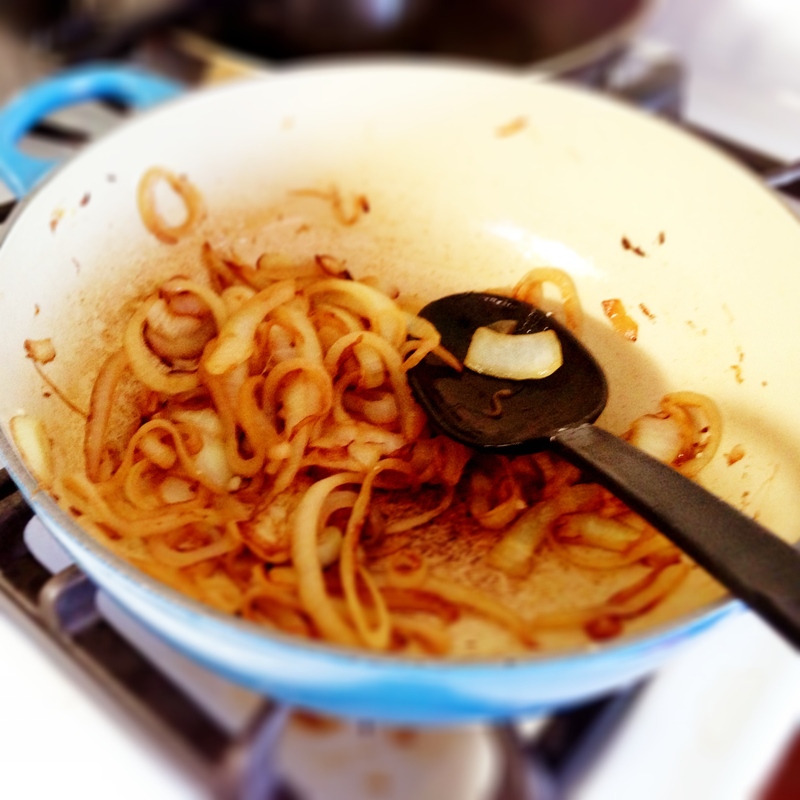 I wish that I had onions and garlic to add to the mix to just kick up the flavor a bit. 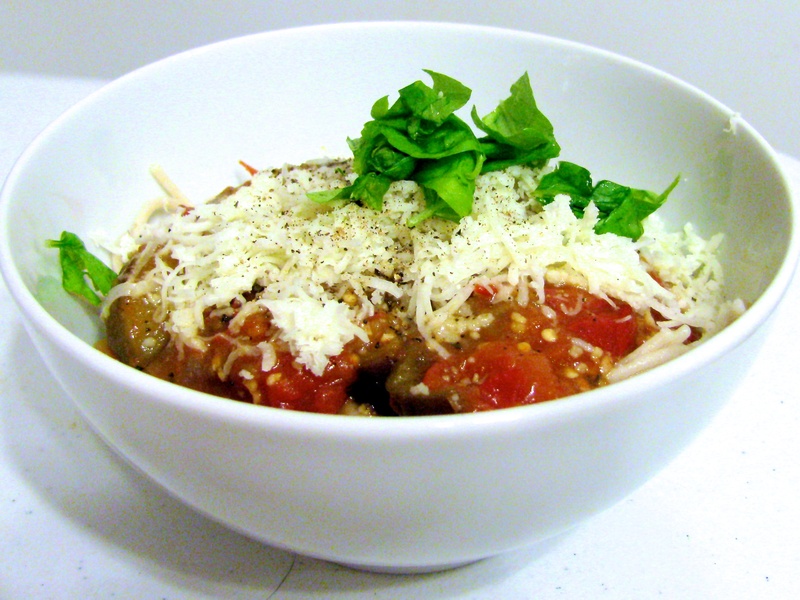 Still, it’s a filling, healthy and quick dinner that will make you smile! It probably tastes better when it’s cold outside, but I wouldn’t know. 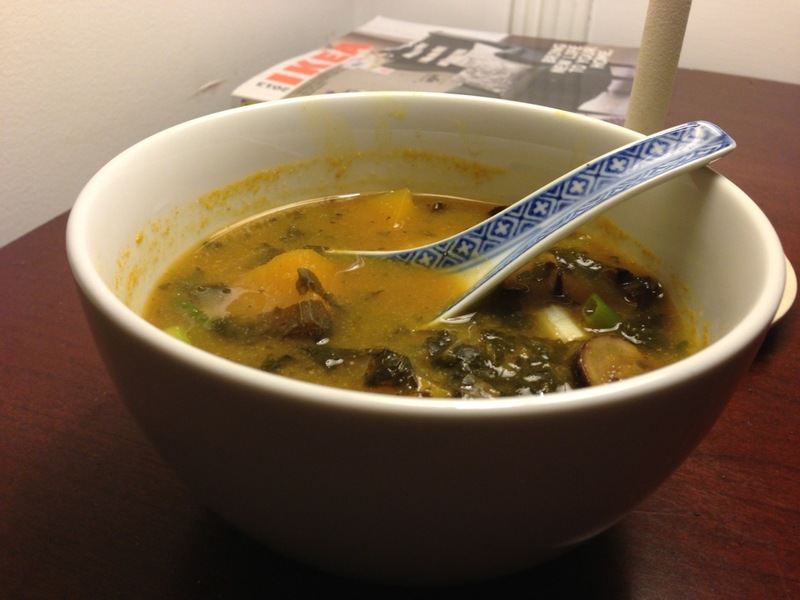 Like most things I make, especially soups, I didn’t actually measure anything I put in. I just dumped it in a pot and let it boil. I put in approximate measurements to the recipe so you have a clue where to begin, but keep in mind I made a GIANT batch! Mix ingredients except for green onions in a large stock pot and bring to a boil. 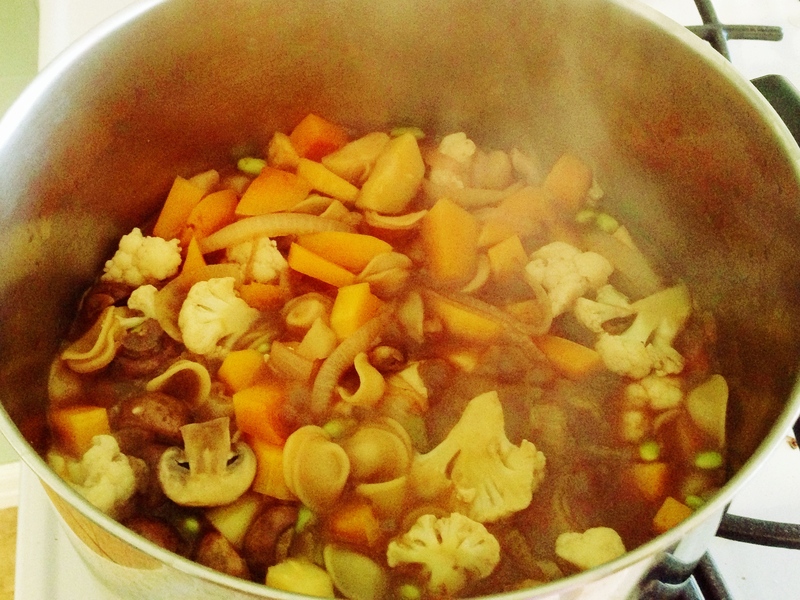 Reduce heat to medium and continue to boil for 30 minutes, until mushrooms and squash are tender. Put green onions into the mix at the end and continue to cook for another few minutes. 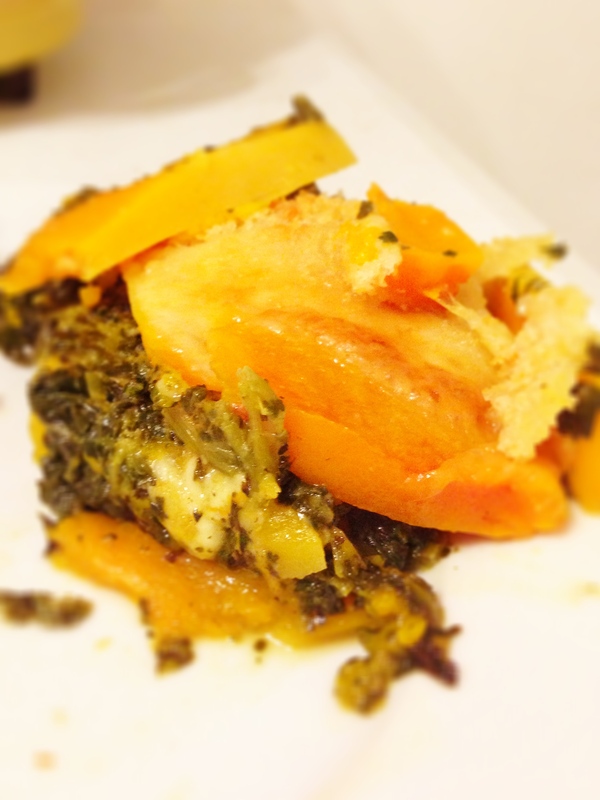 Serve piping hot as an appetizer or meatless main course! Since one of my Skinny Rules this week was to EAT YOUR VEGETABLES (come on! just do it! 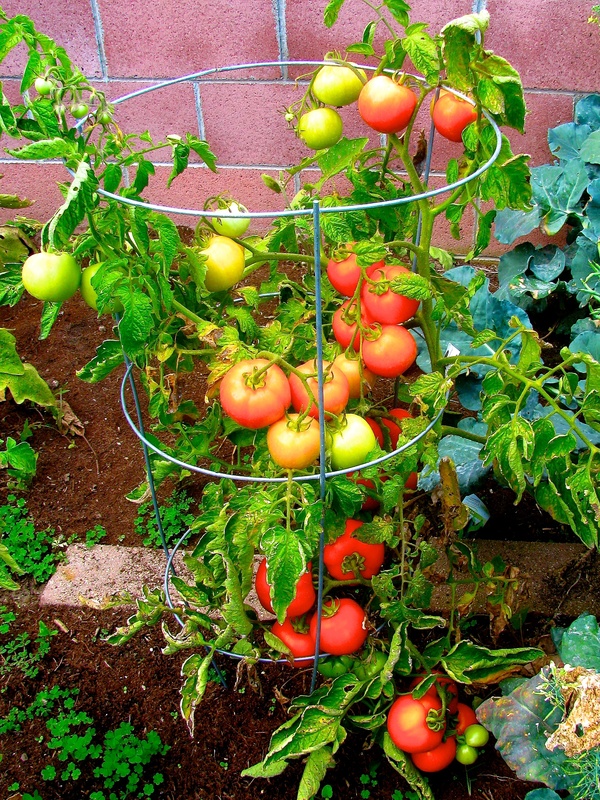 ), I wanted to eat at least a few fresh salads. Also, I had planned to do a post of “hey, what’s in your CSA?” but put everything away before I remembered, and was NOT going to take it all out! 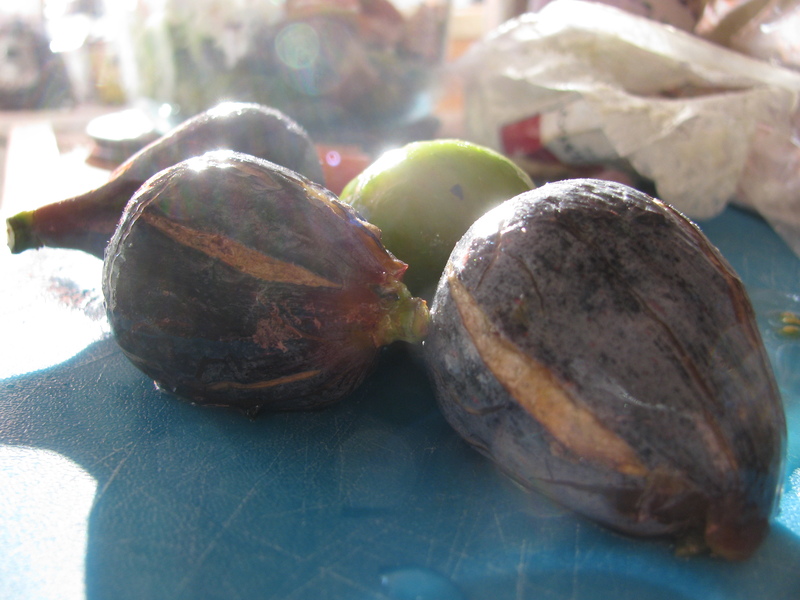 Well, what WAS in my CSA was…FIGS! 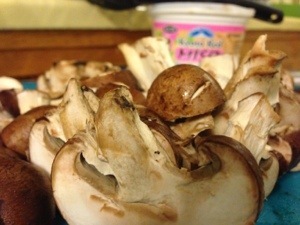 Fresh, sweet, and oh so almost mushy! I had to use them, quickly. I had an idea in my head for a light, goat cheese and fig salad. Can you blame me? I needed protein, so I went with the old classic, chicken. 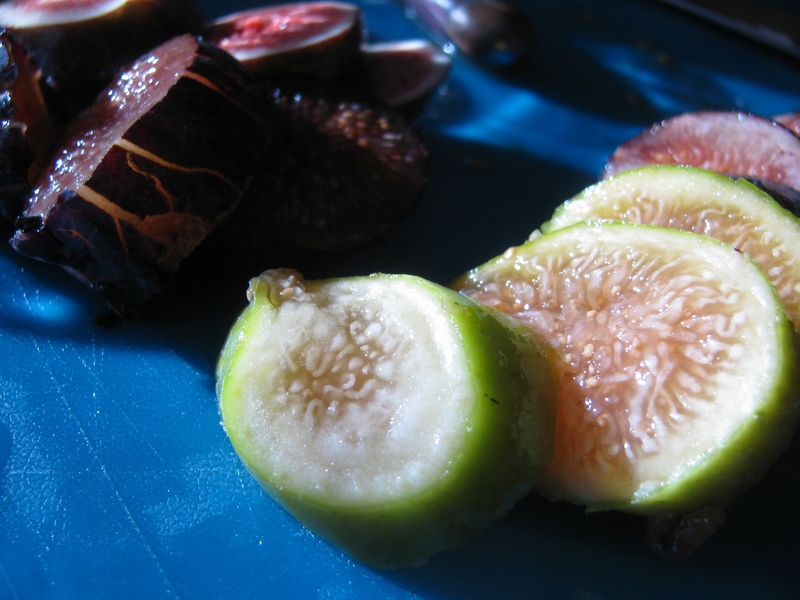 I wanted it to be flavorful and tangy to compliment the figs, and not boring. I called the boy on my break and told him to marinate the chicken so I could make it when I got home! I had the boy marinate the chicken so only he knows exactly what went in there. Friday night it was almost 100 DEGREES in my house so I didn’t want to broil the chicken to make salad, which was my plan. So, I got Thai takeout (ugh another eating out meal this weekend I forgot, and it wasn’t even that great) instead, broiled the chicken later when it cooled off, and made it for lunch the next day. Delicious! 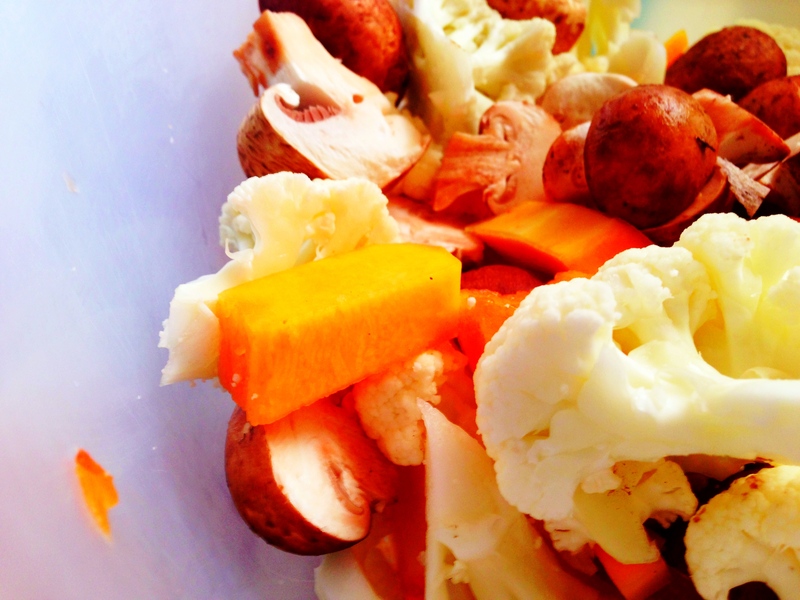 This salad is light, tangy, flavorful and healthy. 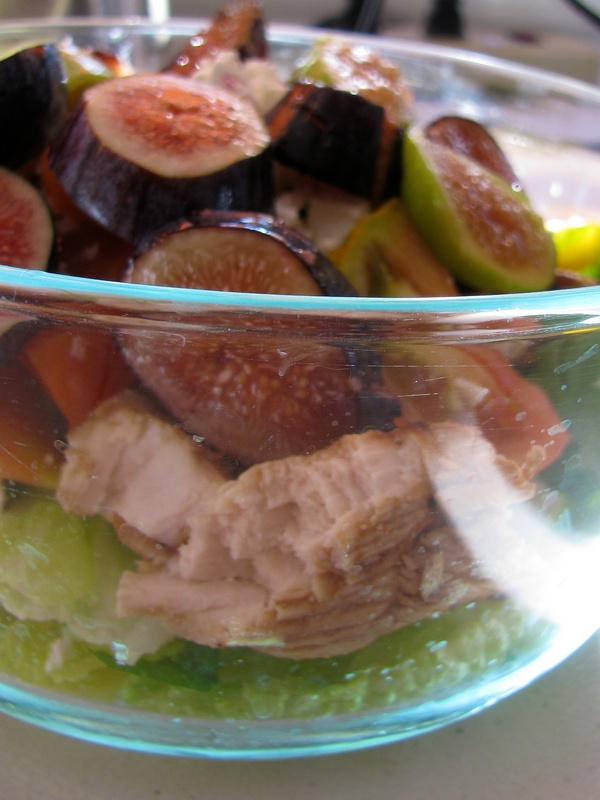 The fresh figs lend a sweetness that perfectly compliments the tang of the vinegar and goat cheese. 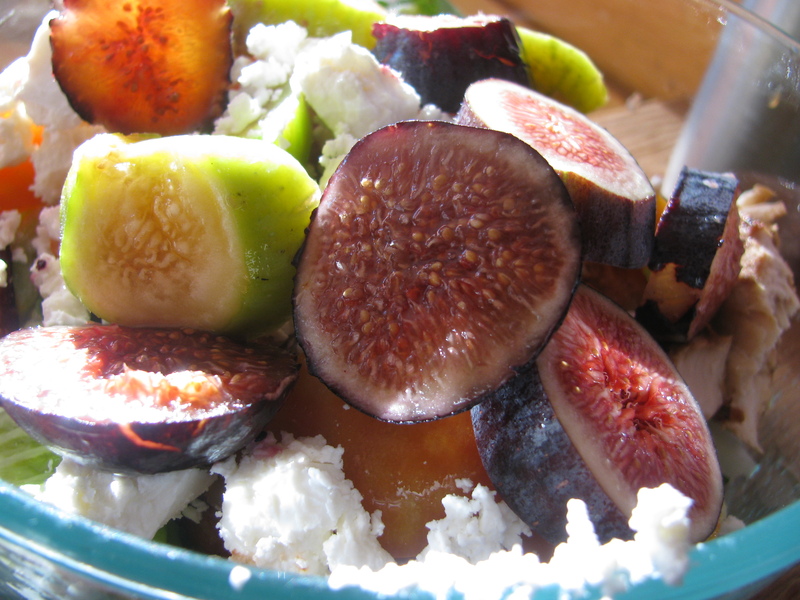 If you don’t have fresh figs, you could substitute apple, strawberry or any other sweet fruit you think would be good with goat cheese (ooh! I know! Pear!) This salad would be great without chicken, and the chicken would be great without the salad! But they compliment each other so nicely, they are perfect together. 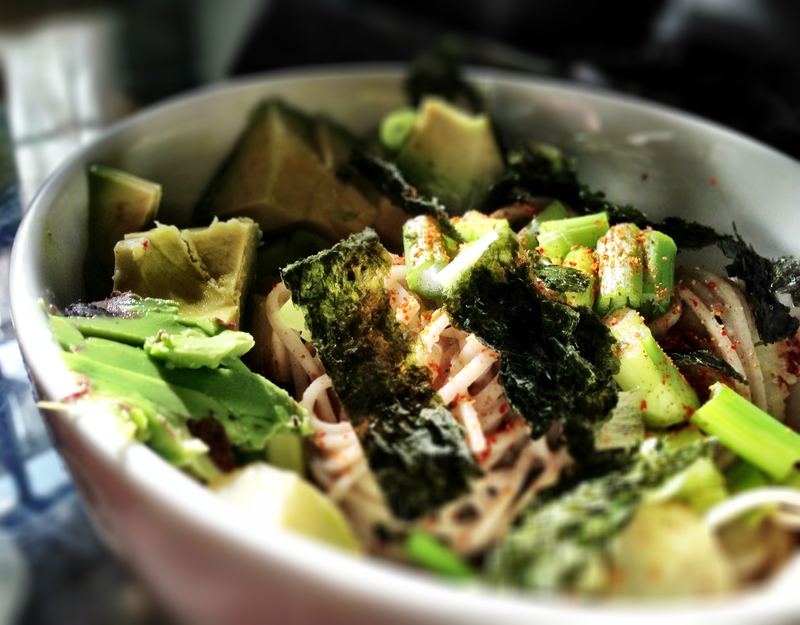 This is a super easy recipe that can make you at least 2 dinners or lunches! If you are making it a head of time, don’t dress the salad until you are ready to serve. 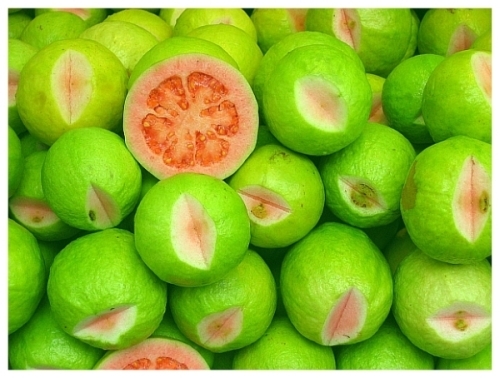 The figs will get super mushy. Always rinse your chicken and pat dry! Always! Marinate breasts in a bag with the ingredients for as long as you can. If you are short on marinade time, cut the pieces ahead of time. Actually, do that first anyways. The more marinade the better! Cut the chicken into (large) pieces. Not too small, you don’t want them to burn! Broil under high heat for about 10 minutes, then turn pieces and broil until the sides are crisp and just starting to burn! 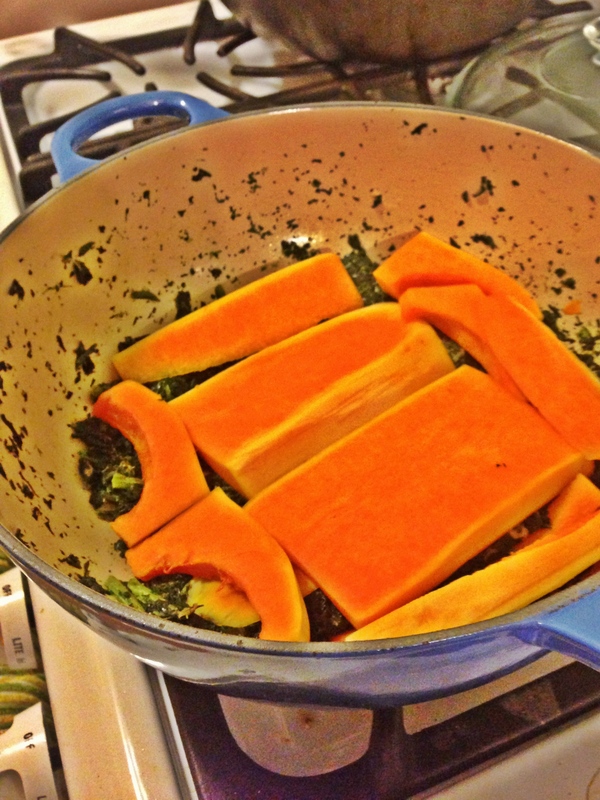 The sugar and vinegar caramelize so beautifully! You could also grill the chicken with great results, just cut bigger pieces so they don’t fall through the grill. Let chicken cool. 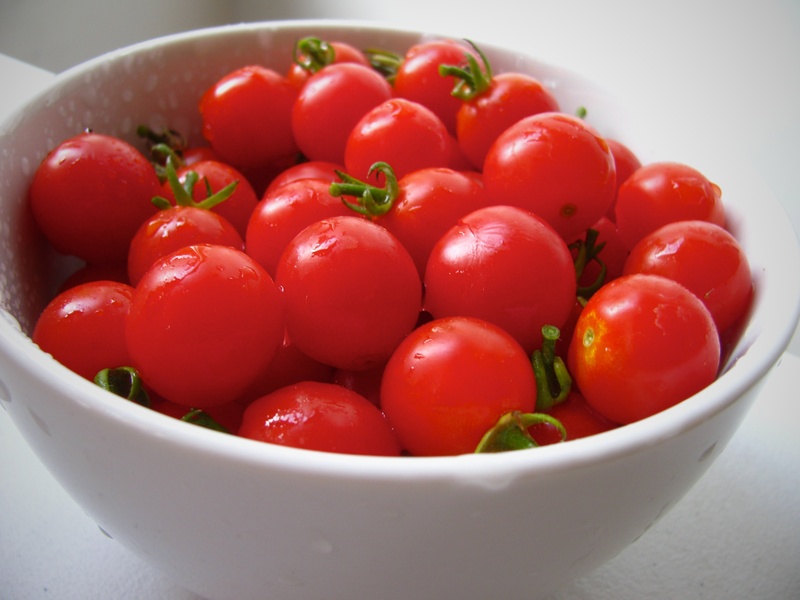 Serve by itself, with cooked vegetables or with a salad! 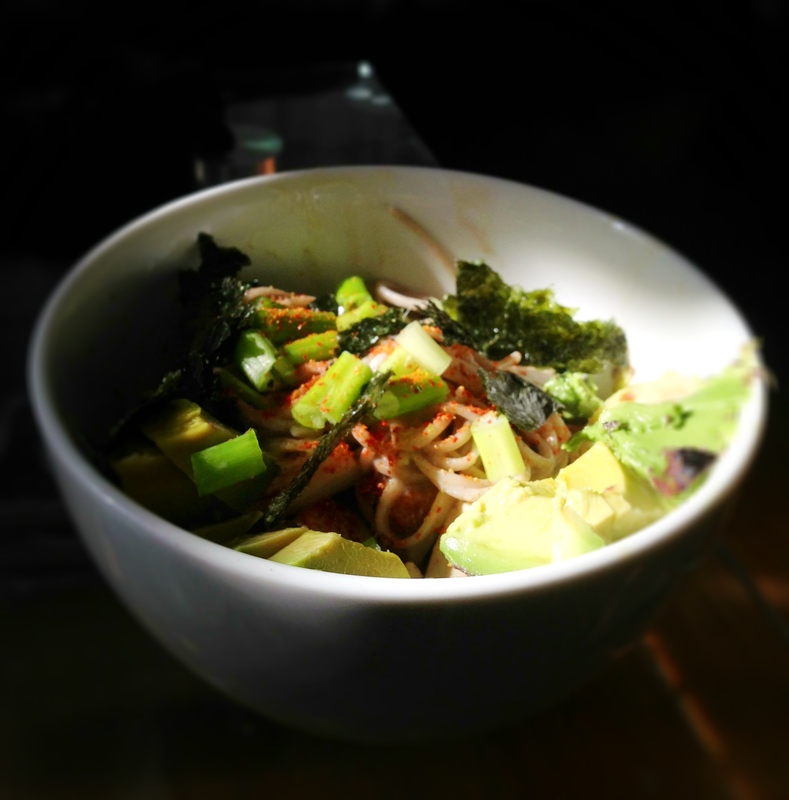 Arrange ingredients in a bowl so they look pretty! Enjoy with a nice glass of white wine! I was so inspired by this awesome recipe for spicy tomato chorizo pasta that I wanted to make my own! But Skinny Rules friendly of course, and today is my meatless day besides! 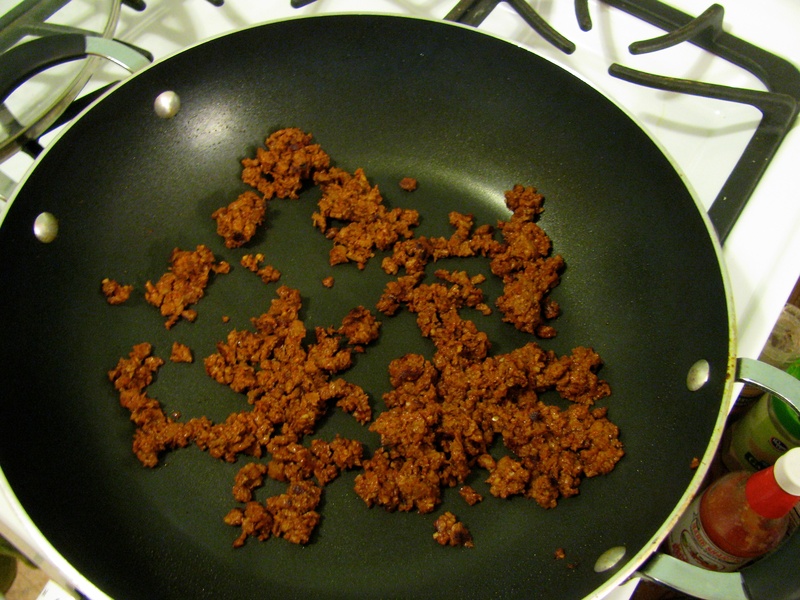 Soyrizo is a great alternative to chorizo, with only 10 grams of fat per large serving. The taste and texture is very similar to real chorizo (a little softer though). I have had a giant zucchini from the garden on my counter for a week and several tomatoes that were just this side of mushy. This sautee is quick, easy, healthy and super super yummy. It would be great over pasta, or with quinoa. I ate it plain and it filled me up just fine! 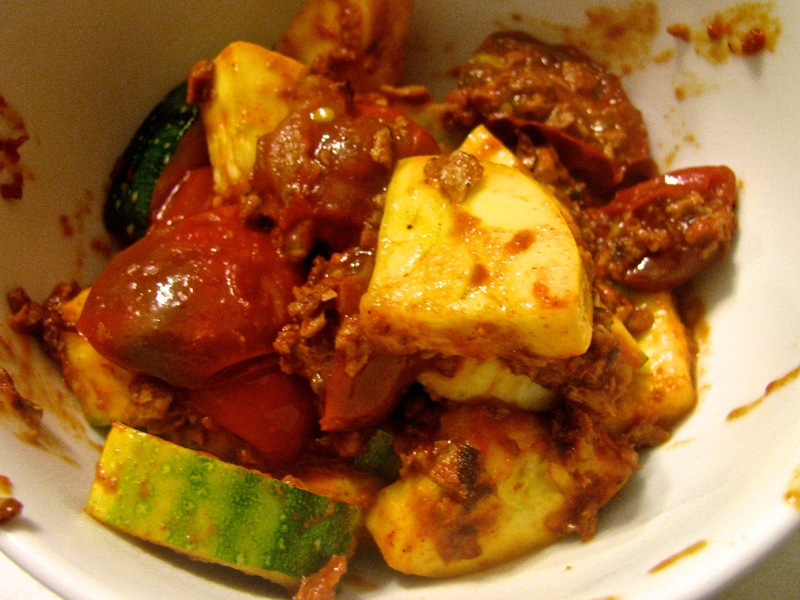 The zucchini are crunchy, while the soyrizo and tomatoes create a creamy, spicy sauce to compliment it. I have left overs and I’m thinking of scrambling eggs with it for breakfast! Drizzle olive oil in skillet and let it heat over medium high heat. Brown the garlic in the oil for about a minute, until fragrant. Add the soyrizo and sautee for a few minutes, until it gets a little crispy. 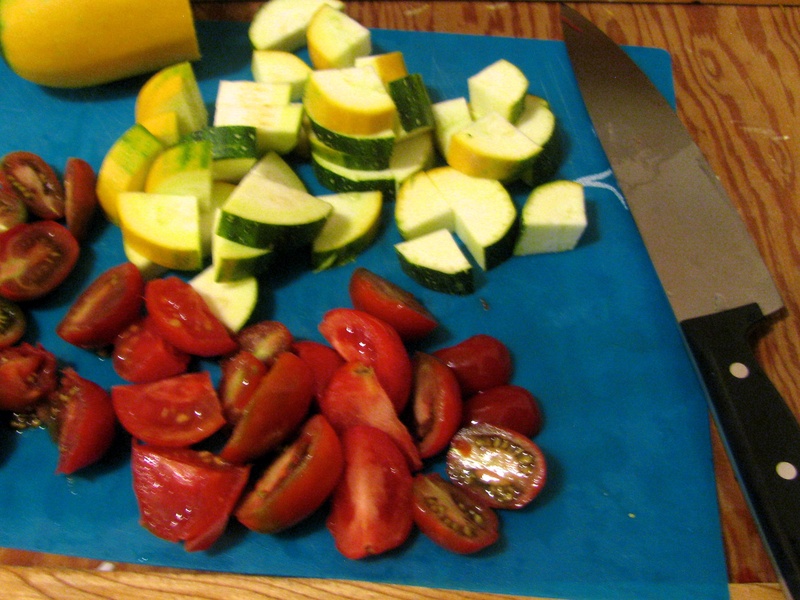 Add tomatoes and zucchini, and continue to cook for another 5 minutes until zucchini are cooked but not soft. You want a nice, firm, crunch! Season with smoked paprika and salt and pepper if you want. 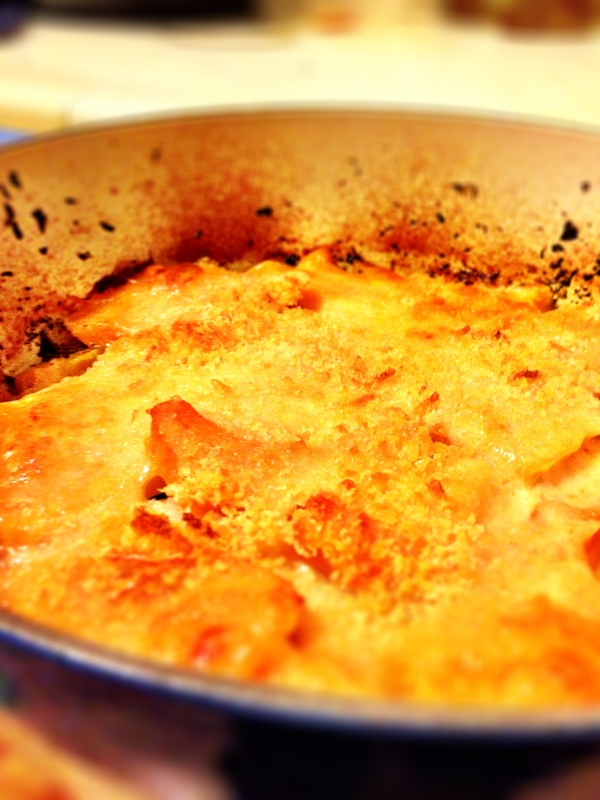 Enjoy over pasta, with some crusty bread, or by itself for a light dinner! 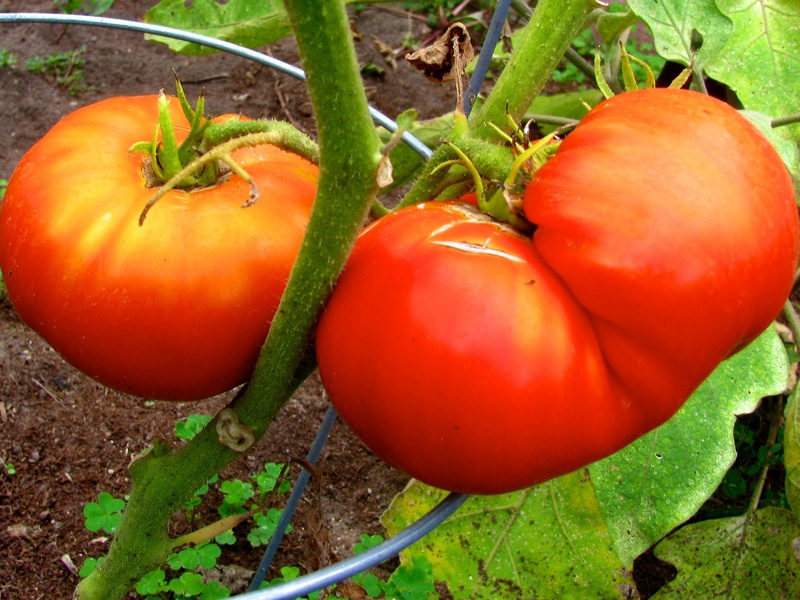 My garden has been bursting forth with tomatoes and eggplants, and today I harvested a plenty! We are going out of town soon, so I needed to use the produce up, and fast. The last thing I’ve felt like doing is cooking lately, in this heat! 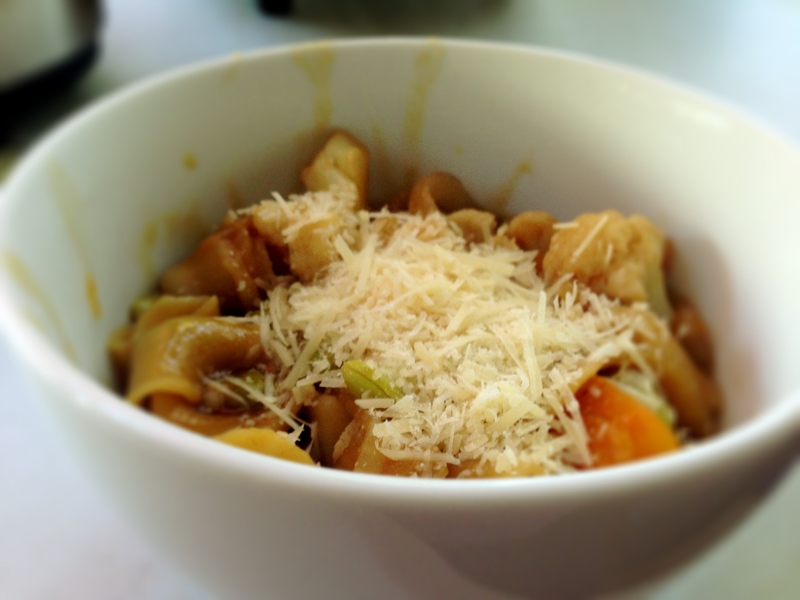 But a nice, light pasta sounded manageable. Additions or enhancements to make in the future: Add lemon juice or zest, use some wine instead of some of the chicken broth, add onions, mushrooms or greens. But honestly, it’s perfect the way it is. 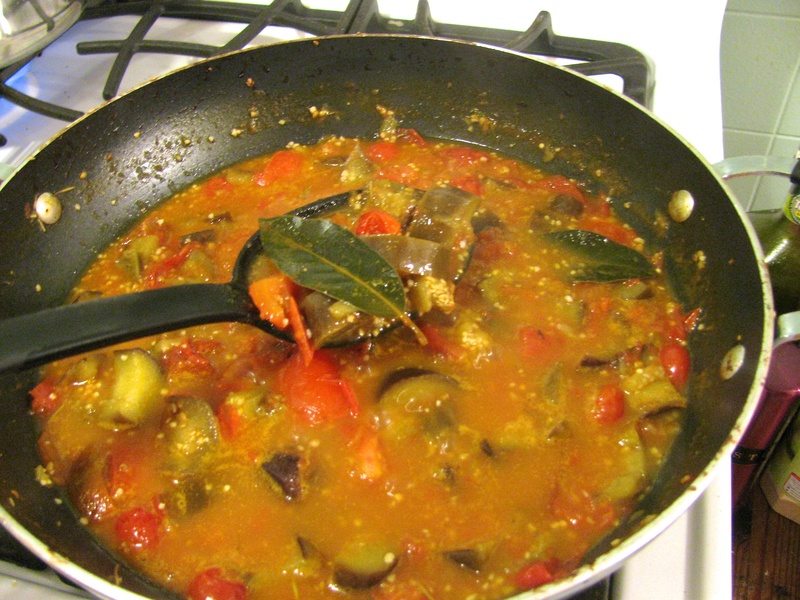 Heat olive oil in a large skillet, then add eggplant. 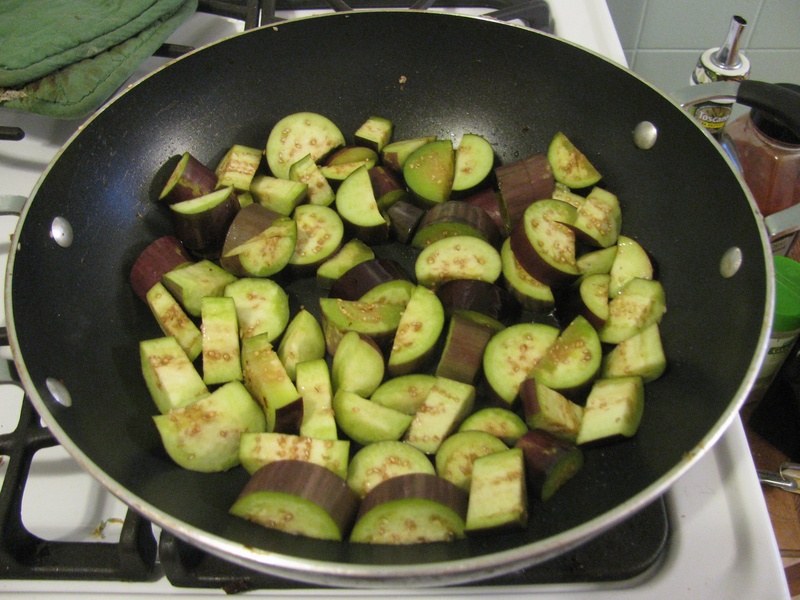 Add a pinch of salt, then sauté eggplant until it begins to soften, about 7 minutes. Add the minced garlic and stir, sautéing for another 2 minutes. 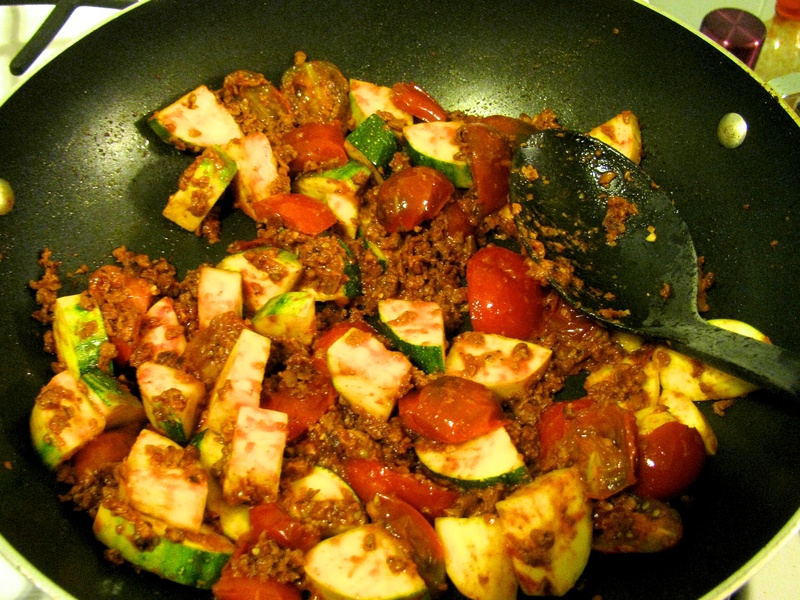 Add the tomatoes and stir, sautéing for another minute. Add the chicken broth, thyme, bay leaves, rosemary and cayenne pepper (wait to the end to salt, as the sauce will become more salty as it reduces). If you don’t have the herbs, don’t worry. I literally just used a tiny pinch of each. Dried “italian seasoning” or oregano would work too. 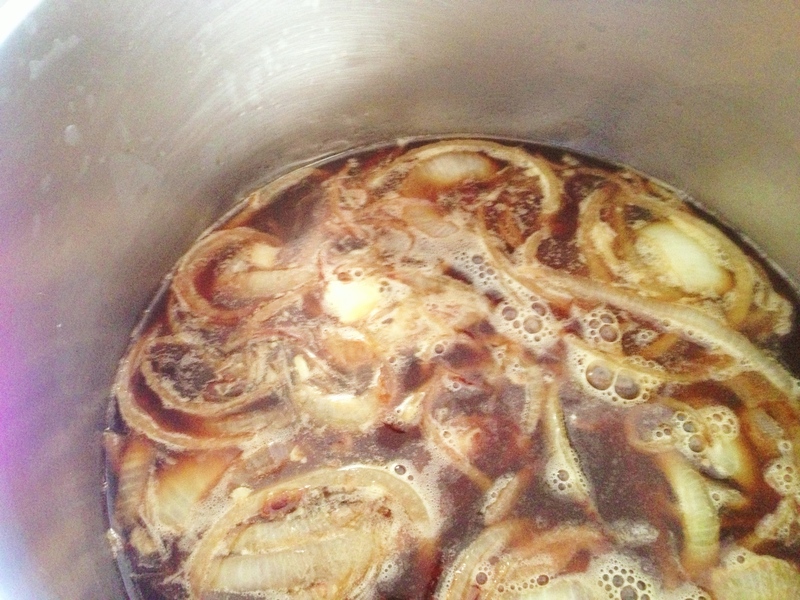 Bring the sauce to a boil over high heat, then lower heat to medium-low. Simmer until the liquid reduces, stirring occasionally. I simmered for a good 30-35 minutes, so if you can’t wait that long, use less broth. But I assure you, it’s worth the wait! When the sauce is a nice, thick saucy consistency (eggplant and tomatoes will be translucent and broken down), you are done! Oh, except don’t forget to add salt and pepper and taste it! 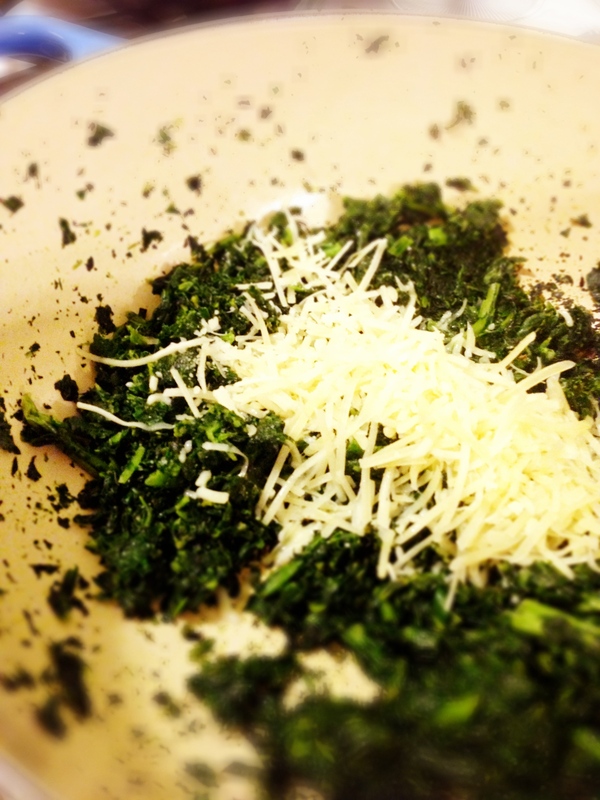 Serve over your favorite pasta, with your favorite shredded cheese and torn fresh basil leaves.